Kauko Maijala was born in Finland in 1924. 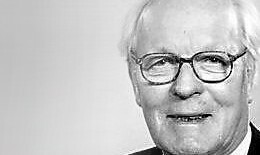 He began his career in the 1950’s working at Pellon Clearing Ltd, holding various positions at the company until he was elected to the Board of Directors in 1964 and Deputy Managing Director in 1966. In 1968 Pellon Clearing Ltd and its subsidiaries merged to form Basic Group Ltd. The group became actively involved in Finland’s agriculture industry, water supply and residential construction over the following years. Maijala was appointed the Group’s Vice President in 1974 and then it’s President in 1977. Under his leadership, Basic Group Ltd expanded into the Middle East and Africa, with exports in these countries and regions accounting for more than half of Basic Group’s net sales in 1978. In the 1980’s, mainly due to foreign expansion, Basic Group’s projects increased in size and number and due to his key involvement, Maijala was elected as the European Construction Industry Association’s Vice President. During his career Maijala was constantly recognised for his business and leadership skills. He later worked with the Finnish Association of the Construction Industry as well as being appointed a Board member of Tapiola and KOP Banks.